Please contact us for orders over 250 pieces. American silver coin Silver Eagle is the official silver coin of the USA. Thanks to which it has the status of legal tender with a nominal value (which is however insignificant compared to the actual value of the coin). Silver Eagle is minted by the US Mint (the American state mint), which also guarantees the purity and weight of the coin. This coin has been minted since the year 1986 and is therefore the oldest state emitted and guaranteed silver coin. Aesthetically speaking, the Silver Eagles are considered as the most beautiful silver coins in the world. The "Walking Liberty" seen on the face, was designed by the world famous designer Adolph A. Weinman in the year 1916. This design was originally used on silver half dollars from the years 1916 - 1947. On the back is the heraldic eagle from the design by John Mercantil from the year 1986. American Silver Eagles are absolutely the most demanded silver coins in he world. On the market they form their own category. It often happens that the US Mint is unable to cover the huge demand for these coins. 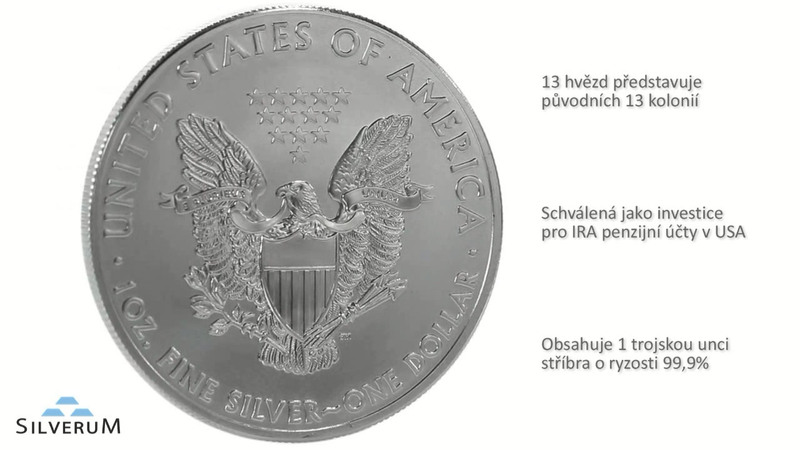 The premium on the Silver Eagle is constantly the highest of all one ounce coins, including those emitted by other countries (Canada, Austria,...). Apart from the purchase of coins which we have in stock, SILVERUM offers you the possibility of ordering these coins, and that is for an unrivalled price on our market. Unlike small businesses in the Czech Republic, who are sometimes able to offer several tens of coins, our company can enable you to buy large quantities (that is wholesale) of these coins. With an order greater than 20 troy ounces, we guarantee the price on condition that the movement of the silver exchange rate on the stock exchange, on the day your payment is received in our account does no exceed a 3% difference from the date of ordering.